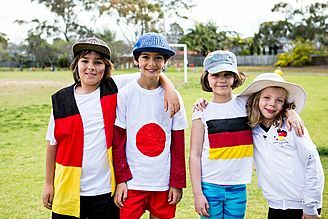 Founded in 1989, the German International School Sydney (GISS), offers a complete multilingual school education from Preschool to Year 12. Our vision is to enable your child to live a fulfilled life in tomorrow’s modern and rapidly changing global society. Our 360 students from Preschool to Year 12 are part of a truly international community, with about half of them coming from Germany, Austria, Switzerland and many other countries and the other half from Australia. Therefore, we truly live our mission to offer the highest quality co-education in a bilingual and international environment. 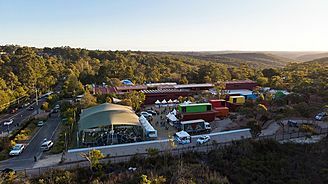 The focus of our curriculum, which combines both the syllabus of New South Wales with the one of the German state Thüringen, are languages, math and the sciences, while following the NSW school calendar year. Students may be enrolled without prior knowledge of the German language. Our content and language integrated learning methods allow all students to be taught according to their language skill set. Our immersion approach also leads to a high bilingual proficiency in both languages. In Years 11 and 12 we offer the International Baccalaureate Diploma Programme (IB) which is recognised worldwide as the best university preparation programme currently available to students completing post-secondary education. In recent years, our IB students have continuously achieved IB scores well above the world average. Furthermore, our highly qualified and dedicated team of teachers guides and supports every student to develop their full academic potential and to become competent, responsible and independent adults. To find out more about our unique learning environment, please visit us on one of our regular Open Days or Open Mornings. Alternatively, feel free to arrange a private school tour anytime by calling 02 9485 1900 to discuss your child’s individual requirements. Peterson, one of the founders of the IBO suggested the aims of the IB Diploma Programme are "to develop to their fullest potential the powers of each individual to understand, to modify and to enjoy his or her environment, both inner and outer, in its physical, social, moral, aesthetic, and spiritual aspects.” (Peterson, A.D.C. Schools Across Frontiers Peru 2003, 33). He emphasized the importance of the concept of general education as process rather than content. Peterson further stated that “the aim of general education was not the acquisition of general knowledge, but the development of the general powers of the mind to operate in a variety of ways of thinking.” (41). This philosophy resonates with 21st Century learning, which promotes the importance of learning skills of application to be able to work with and, process knowledge that is found at our fingertips via the internet. Since its introduction, one of the great advantages of the IB Diploma Programme has been the willingness of IB teachers to experiment with their ideas and practices. Innovative and committed teachers and examiners from many different cultures and systems of education have played a significant role in the development of the programme, and today their participation is as pivotal as ever. GISS IB teachers fully embrace the IB philosophy and methodology, enjoying the chance to inspire students through dynamic and creative approaches to teaching and learning, such as the Socratic method or, a blended and flipped approach driven by our BOYD programme that maximises contact time in classes and tutorials. At GISS, our IB Diploma students enjoy interactive student-centred learning environments in small class groups, many in intimate tutorial style settings, as well as the freedom to learn independently in our Library or, the IB Learning Centre. We also work a flexible 'college style' timetable where IB students are not required on campus unless they have a class, although most of them choose to stay on campus during their self-study periods to be able to access their teachers for individual feedback and advice.